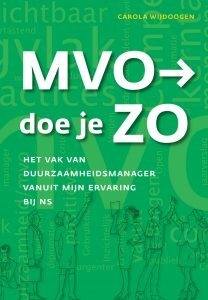 In November 2016, I attended the book launch for “MVO doe je zo”“, which roughly translates into “How to get far with CSR” in English. It is written by Carola Wijdoogen, Director of Sustainable Business at the Dutch Railways. After years of roles in procurement and innovation, she was asked to create this new role. As she embarked on this journey, she asked herself: “What’s the added value of the sustainability manager?” And: “What does a sustainability manager actually do?” Questions she also asked people in sustainability roles in other Dutch companies. She discovered that there isn’t a blueprint or a one-size-fits-all approach. Yet, there are many similarities in the roles sustainability managers fulfill, even across very different companies. The core of the book is her perspective on the seven roles sustainability* managers fulfill. Each chapter corresponds to a role, and within each chapter, after the theory, she supports it with her own experience at the Dutch Railways. She also integrates stories and experiences shared by other Dutch sustainability managers to broaden the relevance of the book. A list of tips for each role completes each chapter. Here are the highlights of each chapter. In the networking role of the sustainability manager, you create and maintain networks around the sustainability field and the organization’s sustainability program. You represent the company and its program in meetings with external stakeholders and other parties. This is all about engaging the relevant stakeholders. Build a network to help you achieve your goals – internally and externally. Think twice before engaging stakeholders. What will you do with their input? What existing engagement methods already exist that you can leverage? Be ready to really listen and learn from others about issues. Bring stakeholders together to discuss issues on which they have opposing views. In the strategic role, you develop the sustainability strategy and integrate this into the overall strategy of the organization. This is all about creating a vision and mission. Tailor your strategic role to the amount of space you’re given within the company and grow that space over time. If you can’t start by integrating sustainability into the overall strategy, create a sustainability strategy that fits into the corporate one, staying closely connected to the core business. Make use of existing processes and teams in the organization to maximize alignment. Be pragmatic and start with what’s possible, instead of frustrating yourself and everyone else with an ambition set too high. And always keep your focus on creating shared value for the company and society. In the coordinating and initiating role, you support people in other departments in the organization to implement the sustainability strategy. You work with many others to create an action plan, to embed it in the organization and to set things in motion. For others to contribute to and implement the strategy, it is key to define very clear starting points. So everyone knows what results are to be achieved. Make sustainability relevant for the entire organization, enabling everyone to contribute with concrete actions and innovations – beyond the usual suspects. Initially, it might include starting up visible, iconic projects yourself. Use your patience, intuition, and knowledge of the organization to determine when the time is right or what organizational waves to ride for success. Create a strong flow of information – formally and informally – to keep people engaged, to stay aligned with the business and to know when to intervene. Embed sustainable change in the organization, yet be alert to other changes around you. To be able to change the plan or the people involved as needed. In the stimulating and connecting role, you act as a sustainability ambassador, inspiring and activating others to integrate sustainability goals into their tasks, usually without formal influence. This is all about generating support within the organization. Learn from others whom to involve, share success stories of people who actively contribute, and consider the unconscious barriers to sustainable behavior change. You can’t overcommunicate about sustainability, but be sure to tailor the content and channels to the diverse audiences. Engage people, don’t just talk at them. Create real insight into the impact and have them experience change rather than just read about it. And be careful to not let this role take up all your time. In the mentoring role of the sustainability manager, you advise, inform and train colleagues, to enable them to achieve the sustainability goals. This is all about translating sustainability to the daily reality of the workplace of each team. Analyze the core processes in the organization to determine the changes needed. Ask lots of questions to generate insight into the role of the others. Through workshops, involve people in designing their individual and team roles. Be creative, but don’t overdesign. It’s OK to say that you don’t know it all – this actually encourages others to step up. Be patient and ensure you have multiple champions per team. Share best practices and encourage people to share their success stories. In the renewal role, you use external orientation to progress relevant ideas for innovation. This role is all about initiating and coaching innovation projects. Create insight into the innovation process in your organization and ensure sustainability is included in the key selection criteria. Position sustainability as a source of inspiration. Leverage internal stakeholders to create a high sense of urgency and support. Keep a long-term perspective, as real breakthroughs take time. In the monitoring role, you monitor, report and evaluate the progress of the sustainability goals and the related development of the organization. This role is all about measurement, reporting, and improvement. Use facts and figures in communications, but also use the power of storytelling. Focus by selecting the most material topics and define the most relevant KPIs for these topics. Integrate the data gathering processes for these KPIs with existing processes as much as possible. You manage what you measure, so be sure each KPI has a clear owner. And look beyond output into impact in the value chain and society. Don’t use reporting as a checklist, but as a tool to embed sustainability into your company. A roadmap for sustainability manager success? These seven roles are not to be confused with a train journey along seven stations on the way to success. While there may seem to be a logical order to them, the reality in each company probably calls for something else. The last section of the book highlights that in any organization, sustainability managers often perform many of these roles simultaneously. And how many of the roles are interconnected. For anyone in the sustainability management role, the book offers insightful perspectives and concrete examples in each of the outlined roles. In a way that enables sustainability managers to critically assess their roles, their focus, and their action plan for impact. So while perhaps not a linear roadmap with consecutive action steps for success, the book certainly offers a map of some kind as well as guidance to better navigate the context of your own industry and organization. The biggest problem with the book? As of yet, it is only available in Dutch and that all the cases are from Dutch companies. There’s talk of creating an international edition, in English, with cases from companies around the world. What relevant cases come to your mind for each of these roles? * Throughout this post, the word sustainability is used to represent a number of terms, including Corporate Responsibility (CR) and Corporate Social Responsibility (CSR). All intended to integrate long-term shared value creation into business. Book review and summary by Marjolein Baghuis (@mbaghuis) for Change in Context. To read about interesting people, book reviews and other posts about change, communications and sustainability, please subscribe. Intetesting review Marjolein! And it is already a step forward that you in your blog already illuminated the content of the book in English.